Sean is joined by Gary, 411mania.com's Robert Cooper, and a special guest who has been watching New Japan Pro Wrestling since 1984 named Tom Reese. The guys hit the highlights of Nights 17 and 18, discussing some of the great matches on those shows. 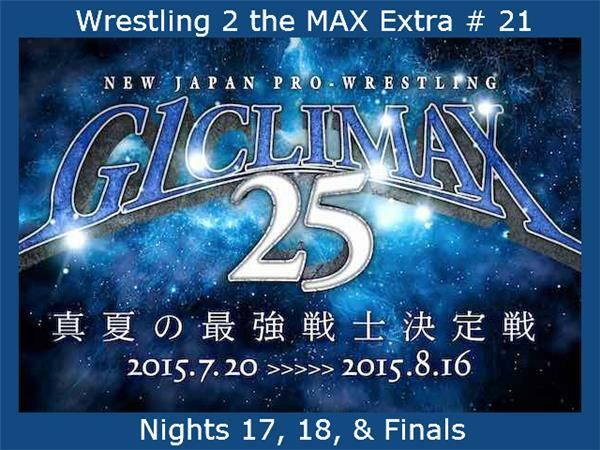 Then they go match by match doing a G1 Climax 25 Finals Review. Everything from the opening tags to the epic closing encounter of the entire tour. Finally, everyone gives their standout things from this G1, their thoughts on the format, what to expect for the rest of the year, ROH saying they will wrestle in Japan in 2016. There's also their Top 5 matches and wrestlers of the tournament as well.